1. To reminisce about a meaningful game that you attended that you never want to forget. Whenever you look at the memorabilia item that you bought – a ticket, autographed ball, or program – you relive that awesome moment when your team won a big game or your favorite player set a record. 2. As an investment. Knowing what items will increase in value is very hard to predict. It depends on how popular a player is over the long term, and how rare is the item. It’s good to collect items that are meaningful to you, regardless of their resale value. 3. Because you enjoy collecting and displaying the items. It is exciting to find something that you’ve been searching for at a show, online, or at a flea market, and then to bring it home and find a special spot in which to display it. 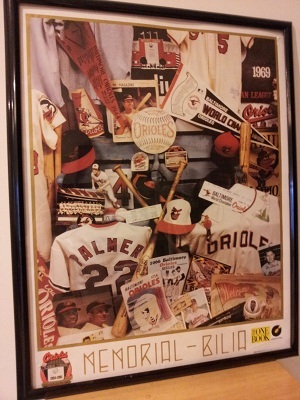 I like to find unusual and quirky items, especially old Orioles memorabilia that I remember from my childhood. Also, the “running Presidents” bobble heads from the Nats! Why do you collect sports memorabilia? 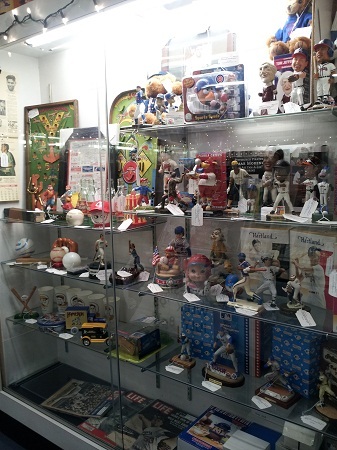 Mendy’s Baseball Memorabilia will be at the Westminster Antique Mall (Westminster, MD) on Saturday, February 16, 2013, from 1pm to 4pm, providing free appraisals of your baseball memorabilia. Drop by to have your items appraised and talk a little baseball! Westminster Antique Mall is at 433 Hahn Road, Westminster, Maryland 21157.